I just had a few photos from the last half of 2013 that didn't really fit anywhere. We had a lot of events in the last half of the year so many of our photos are or will be on regular 12x12 pages. 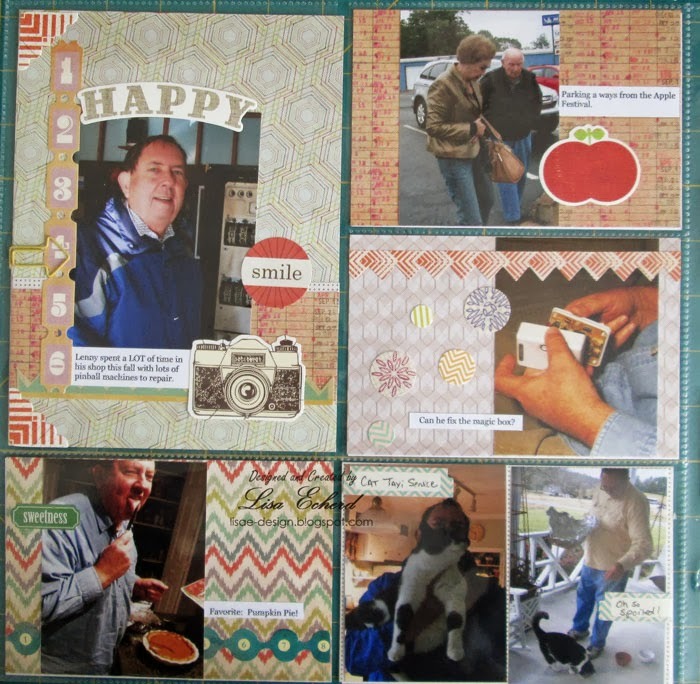 So I thought I'd take these last few and do a couple of pocketed pages. 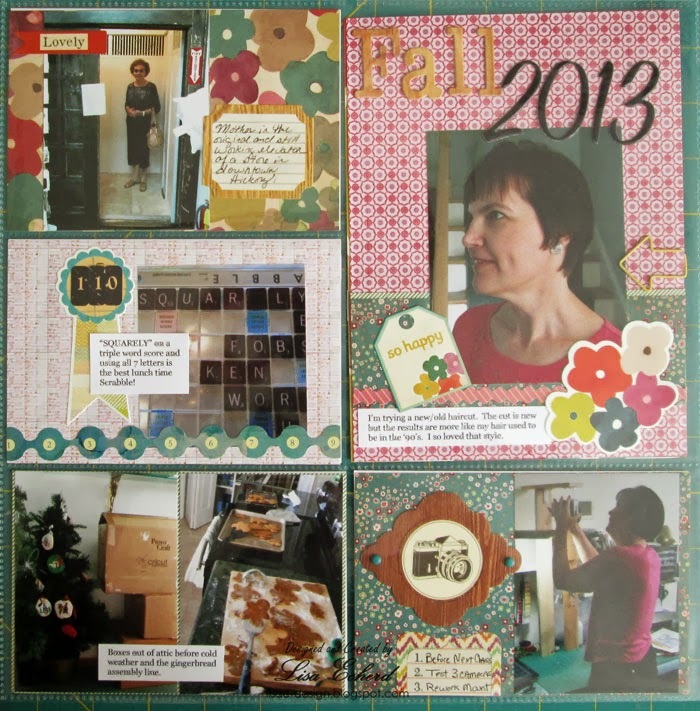 I'm trying to use up some older product and the Acorn Avenue Collection from Crate Paper was fall 2012 I think. I've used quite a bit of the 12x12 but hardly touched the 6x6 pad. I also have die cuts and stickers for this one. For these two pages, I used almost exclusively this collection only adding a Two Peas paper clip, some lettering and a couple of brads to finish off the pages. 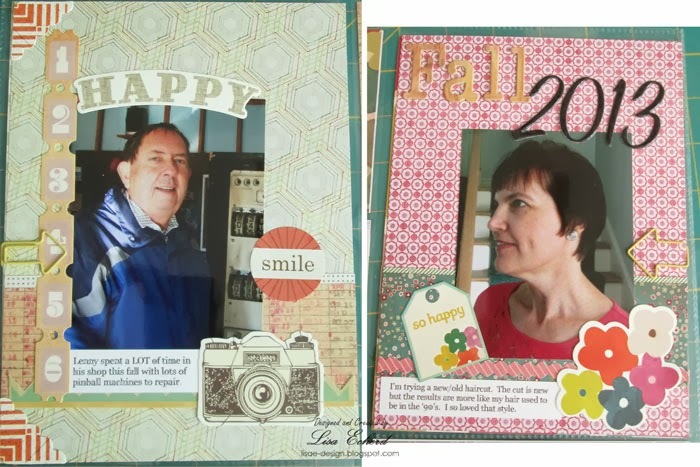 Since these are going to be by themselves in my album, I'm arranging the pages back to back with just one page protector rather than the traditional 2 page spread. Here is a close up of the two 6" x 8" sections. Please excuse my lousy photography. They really are the same size in real life. I put the title on 'my' side and more stickers on my husband's side of the page. I divided the photos based more on which of us they were related more to rather than chronological. I just realized I didn't put any dates on these. They are just every day moments in the last 4 months of the year. Thanks for stopping by today! I'll soon have an anniversary giveaway for you to enter. This page is particularly helpful to me, Lisa. I need to do some Project Life pages, and I hadn't really thought of using embellishments this way in each of the pockets. Thanks for sharing!